This is at the same time a very entertaining and very educational book. Reading the book is a lot of fun and a serious introduction into the world of wine. The book is very densely written. Wolfgang Staudt manages to transmit quite a bit of information to the reader. He digs deep, to the benefit of the reader.Wolfgang Staudt knows how to present an issue in a systematic and concise way, whithout becoming too dry. He probably learnt that in his previous life as a political scientist. I appreciate it very much that Wolfgang Staudt is not somebody who likes to gloss over critical issues - such as the question, why are there Spaetlese (Late Harvest) wines that are fruity-sweet and others bone-dry - in a superficial way. Wolfgang Staudt has arranged the 271 pages of his book in 50 chapters, starting with “Dry Wine – White, Red, Rose” and ending with “Wine for Dessert – A Smooth Finish”. The 50 chapters are grouped under seven main headings. This series of chapters starts out with a chapter on dry wine and clearly states that wine is typically dry, if you leave it to Mother Nature. In order to have a sweet wine in the glass, special factors, like stopping the fermentation or the noble rot need to come into play. The different approaches are reviewed in the second chapter. Then, he moves on to sparkling wines and fortified wines, and concludes with a chapter on distilled wines. On these first 15 pages, you already get a pretty good introduction into the world of wine. Second and third, the next 2 groups of chapters provide an introduction to tasting and appreciating a wine with the eyes, your noseyou’re your mouth. Wolfgang Staudt teaches you the basics of wine tasting and helps you become a better wine taster. 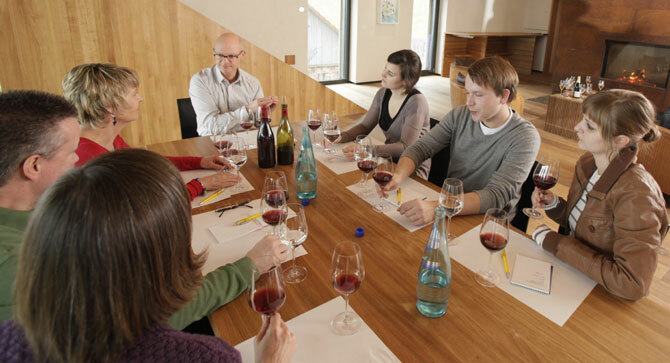 You learn how to distinguish wines based on acidity, tannins, sweetness, aroma, and body. Fourth, the following 3 chapters try to give the wine drinker a handle on how to read a wine label. 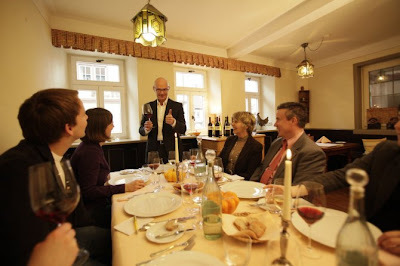 The focus is on German wines - not only the classification of 1971, but also the new approach of the VDP, Germany’s association of elite wine makers. In addition, the wines of France, Spain and Italy - the most important imported wines in Germany - are also briefly covered. Fifth, the following 7 chapters come under the heading: Genesis of Wine - Here, Wolfgang Staudt ties together three areas: he provides an overview of the different grape varieties that exist in the world. He reviews the various wine producing regions in the world. And he discusses in one chapter, what the vintner can do in the vineyard and in another chapter what the winemaker can do in the cellar to influence his final product, the wine. Sixth, then follow a number of chapters on how to serve wine and how to enjoy wine with others. These chapters contain a lot of bits and pieces and I found them the least fascinating chapters. I would cut this series of chapters back in a forthcoming revised edition. But other reads might enjoy the subjects more than I do. Seventh, the last 10 chapters, also perhaps a bit on the long side, review the question of matching food and wine. It goes into topics such as “Fish and Wine – White Wine a Must?” and “Wine and Dessert – A Round Finish”. Overall, this is a book that could usefully be used as a companion book for a wine class. But it is not at all targeted for a newcomer. I think also an experienced wine drinker will find quite a bit of information that he or she might find useful.